As efforts to redevelop the old Foster Pontiac dealership on Milwaukee's south side illustrate, plentiful opportunities remain around the country to convert obsolete auto lots into small-cap, income-producing commercial properties. Finding the right sized and shaped site in a high-traffic location is tough enough. But redevelopment teams of course also aim to uncover (and finance) attractively priced transactions, perhaps via a distress situation - no easy task amid prevailing competition for assets. Then there's assembling the right mix of users, some of which might insist on owning their parcels. Meanwhile, local regulations are subject to change midstream - possibly affecting economic viability in some instances. Indeed the Foster family, longtime owner of the site along the South 27th Street commercial corridor, ended up leaving much of the 3.4-acre site idle since before the Great Recession as members pursued redevelopment plans they eventually abandoned late last year. Ultimately the family relinquished the property in lieu of foreclosure to the new noteholder - which happens to be the team now actively redeveloping the site in the Southpoint neighborhood southwest of downtown. The Fosters last rendition, pursued with locally based would-be co-developer Endeavour Corp. (which has regularly tapped the federal New Markets Tax Credits financing program), had envisioned an approximately 30,000-square-foot retail/restaurant project estimated to cost $5.5 million. 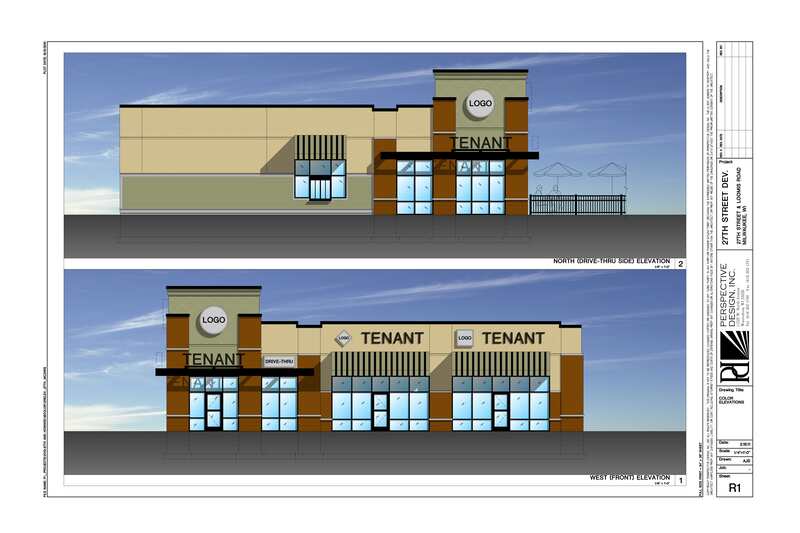 The team touted Rocky Rococo Pizza and Auto Zone as pre-lease anchors. Even though the property represents a rare site along that stretch of 27th deep enough to accommodate a high-traffic restaurant, the Foster group ended up negotiating an exit when the team was unable to secure sufficient financing. Enter a couple Illinois real estate outfits that formed a 50/50 joint venture to pursue the property: Terraco Inc. of Wilmette, and Frontline Real Estate Partners of Northbrook. The venture purchased the defaulted note securing the property from Fifth Third Bank for $950,000, then negotiated a deed in lieu of foreclosure with the Foster family-controlled group that owned the site, reports Terraco senior vice president Dan Wander. Coldwell Banker Commercial's Bruce Heller in Chicago played an integral role in the ownership transfer. Wander declined to identify the capital sources or terms for the site's purchase, only indicating the developers are working with "private" equity and debt providers. Headed by founder and CEO Scott Gendell, Terraco has developed 80-some mostly retail projects totaling more than 5 million square feet over the past quarter-century. Frontline is headed by Mitch Kahn, Josh Joseph and Matt Darin, all former acquisition/disposition specialists with Chicago's Hilco Real Estate. It specializes in turning around distressed situations. The Terraco/Frontline venture's development plan - dubbed Wilson Creek Crossing - is a bit more modest, with build-out slated for somewhere between 20,800 and 23,200 square feet (replacing the existing 32,500-square-foot dealership structure). With two users likely ending up financing and owning their own facilities, Wander estimates the development team's costs will likely end up in the vicinity of $3 million. First-phase work is just under way on a Buffalo Wild Wings, whose parent Oscar Inc. will own the real estate. Buffalo Wild Wings tapped the Small Business Administration for financing covering the purchase of its portion of the site. The approximately 8,000-square-foot structure will also house a 1,500-square-foot Jimmy John's Gourmet Sandwiches. Meanwhile with the help of agent Mid-America Real Estate, the Terraco/Frontline venture continues seeking users for two additional planned structures: the developers' 8,000-footer, and another likely user-owned structure of 4,800 up to perhaps 7,200 square feet. Wander is optimistic the team will soon land more merchants. After all the economy is improving and the site is directly across 27th from magnetic retailers including a Walmart Supercenter, Michael's Arts & Crafts - and Wisconsin-grown Kohl's. And it doesn't hurt that the city recently designated the commercial corridor along 27th as a Development Incentive Zone - which means development reviews get priority, but also imposes stricter design and landscaping requirements. To that end the city is kicking in $175,000 to help fund a new left turn lane into the development as well as some of the landscaping expenditures.